Songs and dance music played with enthusiasm, fun and experimental spirit, the Short Tailed Snails are influenced by a musical history spanning eight centuries and the traditions of many European countries. They combine Early Music with Folk and World Music to tell timeless tales of joy and sorrow, enchanting their audience with stirring tunes and heartbreaking ballads. 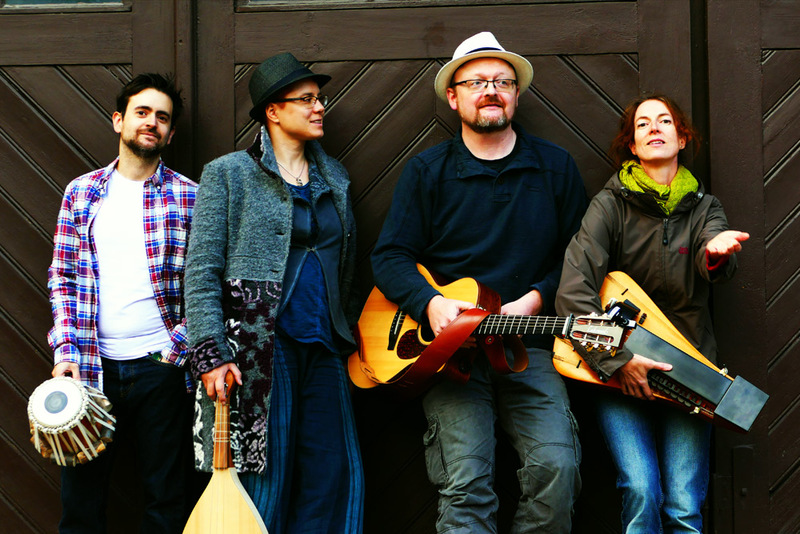 The Short Tailed Snails formed in the year 2010 in Heidelberg, comprising Regina Schmidt (voice, Chrotta), Ines Hartig-Mantel (wind instruments, hurdy-gurdy, voice), Bert Brückmann (guitar, cister, bass) and Ismael Bou (percussion). If you want to know how we sound, please look under Aufnahmen. There are also some live recordings. To get in touch with us please got to Kontakt. Her clear and flexible voice, formed by many years of vocal training with a specialization in early music, gives the "Snails" sound its distinctive flavour. He started his musical career playing electric guitar and bass in rock bands. Meeting the acoustic guitar for the first time, it was love at first sight. Since then, he has focused on the experimental guitarists of the 70s. He also plays cister and bass. The band's multi-instrumentalist, she also plays medieval dance music and has been an active and passionate part of the German-French folk dance scene since the mid-nineties. He has been playing classical Indian music for many years and has specialized in the tabla. With tabla, frame drum and other percussion instruments, he is responsible for the groove and "oriental touch" of the band.